Drafting, for any organisational activity, is integral to the success of many businesses for many different reasons. Nearly all kinds of businesses run on the premise of making a draft of something and receiving appropriate feedback before a final product, service or plan can be properly executed. So then, do websites do the same thing? Of course! In our industry, this is known as a mockup. Websites specifically go through two stages of the drafting process – the Wireframe and the Mockup. These processes are connected, but entirely separate, with one following the other, and both of them are vital for website development. Just as you wouldn’t build a building without an architectural blueprint, you would never build a website without a wireframe and mockup, as they are our architectural blueprints! Wireframes, are also known as a “page schematic” or “screen blueprint.” They are a visual representation of the bare bones of what a website page will look like at the end of the building process. This gives a developer both an idea as to where areas need to be developed or designed in a certain way. It also gives the client an idea as to where content will go, what size it needs to be, and how much work is involved. Wireframes also showcase the navigation, of what pages connect to where so that changes can be made there, too. 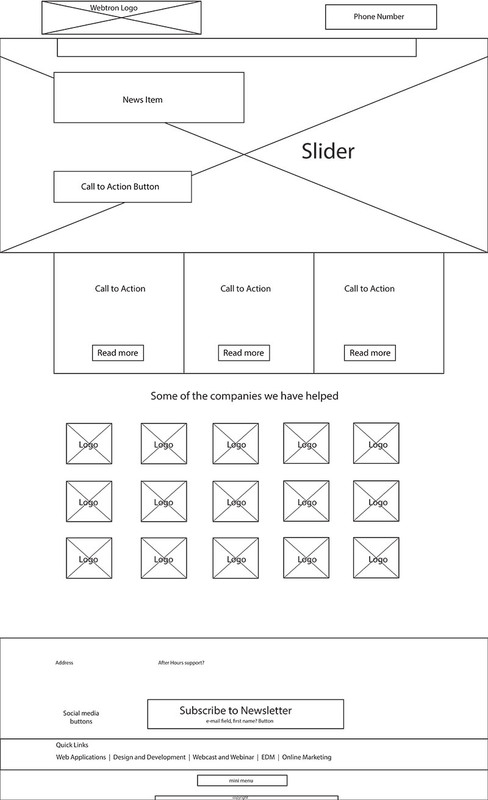 Often, mockups are started when wireframes are approved. Mockups serve as a true visual representation of what exactly the website will look like once it’s completed. Mockups serve the further purpose of making changes and fixing any outstanding design issues before the website is built. This way, clients get the best possible choice when it comes to their website’s design. Wireframes are anything from a digital, detailed work to a sketch in a sketchbook. It depends on the level of detail needed for the mockup. How do these help create a website? Not only do wireframes and mockups keep the client in control during the design process. They also provide the designers and developers with particular specifications that adhere to their own design and development requirements. Therefore, developers can gage what the client can expect in terms of costs of production from a visual standpoint. But this is not as easily communicated through a contract. Making both a wireframe and a mockup also saves a great deal of time in the building process. This is because wireframes and mockups lay down the foundations for the final of any website. Colour choices, navigation, and content have been almost completely decided at this point. This makes the building process much easier from this point on. Many companies tend to look over this vital process as a time wasting exercise, however, Webtron do not. Webtron value all communication and feedback between our clients through all steps of the design process. This ensures both the development and maintenance of a high-quality website, tailored to your individual business needs. Contact us for more information.